These notifications only appear when there are outgoing and incoming marches. Red is for aggressive marches. Green is for all other marches. The information you get here is pretty self-explanatory. You can filter to specific kinds of marches by clicking their buttons, should help your sort through whats going on when you have a lot of things in action. You send spies and if you succeed in you get told, how much resources, armies and military developments the enemy has. For particular details how espionage works - read the Espionage article. Simply - if people do not know what you have - they are much less likely to attack you - being covered in secrecy as good a way to rule as any. The two basic attack marches are Plunder and Raid. Plunder: - In order to succeed and take resources from the enemy you have to break through the city wall and overpower all defenders. Failing any of these steps will not get you any loot. Keep in mind that spy reports show ALL resources - the ones the enemy can hide in stashes are not subtracted from your reports. The attacker heads on to assault the castle and has to defeat all enemy troops in combat - to get the loot (if there is any). Raid: -- It attacks only the city's surroundings without trying to break the wall and steal resources. Early game this is irrelevant to you as people have small armies that can be fitted inside castles. In the later stages when castles expand and cannot hold the whole army within the walls some troops are placed outside. You can use this march to pick them off without engaging the full city's force as the attacker makes a sweep of the defender field and heads on home without attempting to breach the castle wall. 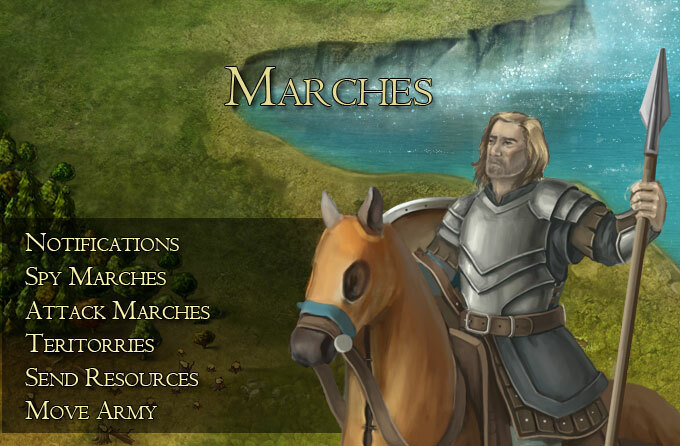 Similiarly to Plunder march, the Siege march aims to clear all enemy troops - in and outside the castle walls. 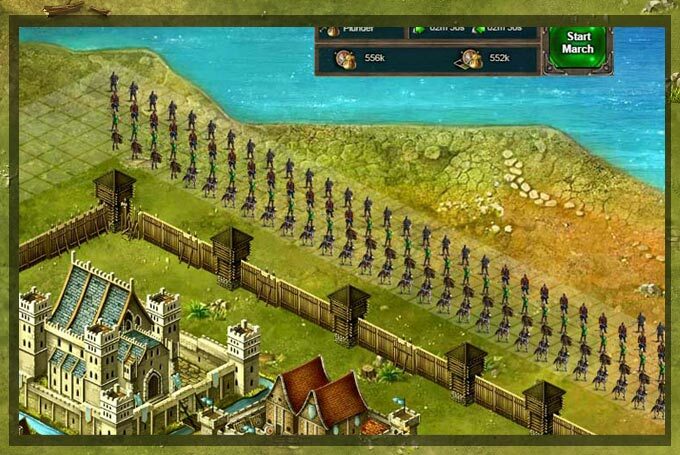 The tricky part is that Siege march takes 36 hours before your troops can attack the castle. Requirement - Siege attacks can only be started if the player has available city slots. Players can easily find out how many cities they can currently control, colonize or conquer by going to the building Info for their Palace. 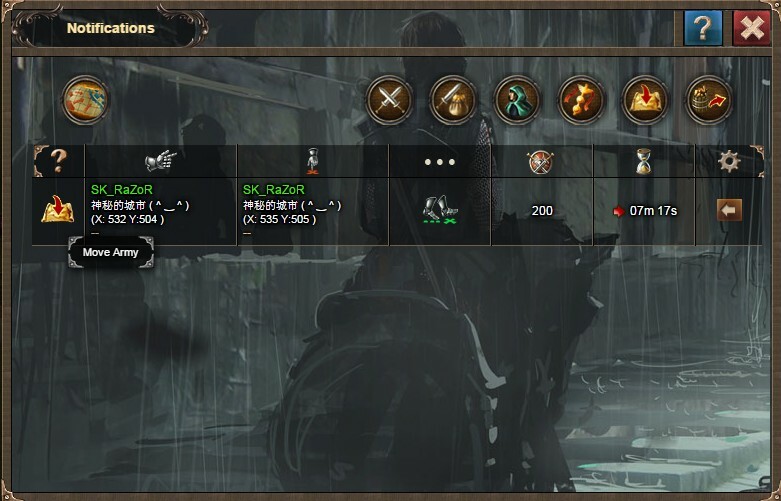 Players are given +1 additional cities to control after completing each Palace upgrade. This means that the minimum requirement for a siege attack is to have a Lvl2 Palace. However if You decide to colonize a new city you would need to wait until the next palace upgrade (Lvl 3 ) if you want to be able to launch a Siege attack. 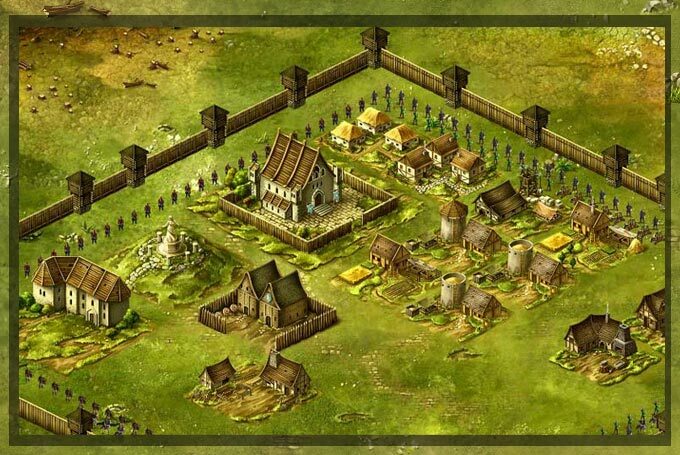 To start a siege attack, simply go to Global Map and find a castle you wish to conquer and place your units , as you would for any other attack. When your army reaches the destination, an icon will indicate that the preparations have started and there are 36 hours before the battle starts. - After the battle finishes, the winner claims the territory, buildings and resources produced in it. The castle owner can start the battle sooner - or send reinforcements to fight the attackers off. So , what can you do when someone launches a Siege Attack on your castle? You will get a standard march notice and you can monitor the army moving to siege you. 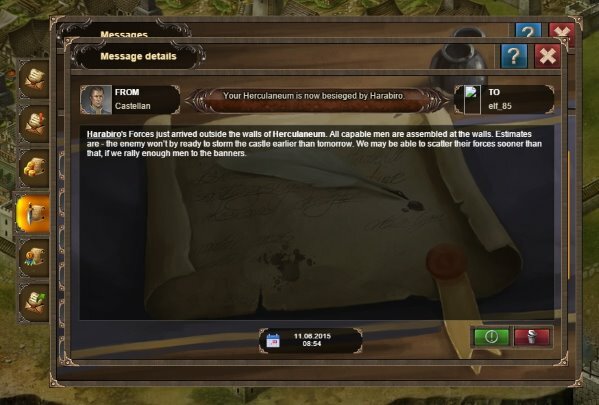 When they arrive You get a message from your Castellan . 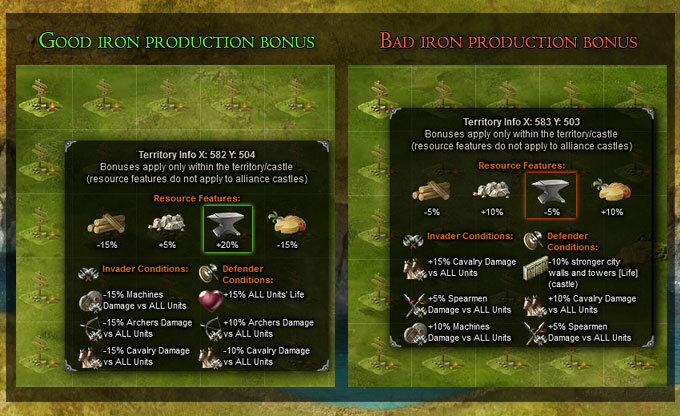 You will also see a notice under the resources interface, counting down the time before the battle starts. 1. You can train units and fight once the time has come. Send reinforcements from other cities. 2. If and when you are ready you have the option to Break the Siege = thus start the battle before wait time runs out. - You can go to City Garrison , have a look at the enemy forces and then start arranging your army. You can see the enemy forces gathered around your city and decide whether to provoke an attack or not. Once your army is ready to defend use “Break The Siege Now” to start the massacre. After the battle players will receive a message with battle report . In the case that you’ve lost the battle you will receive an notice pop up and the city name will not be present in the city switcher where your other cities are. From that point on you can either plot revenge, siege someone else or simply colonize another city. 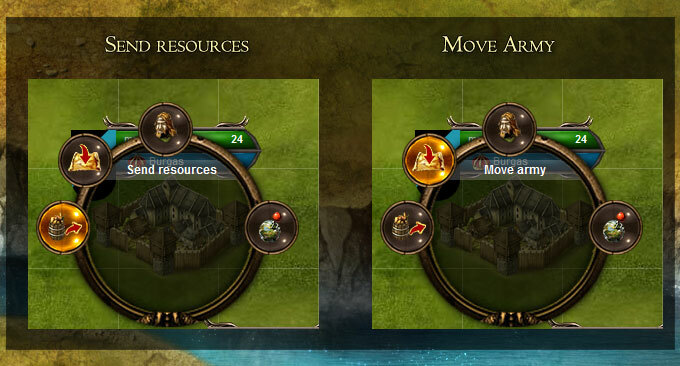 After selecting a location and a resource bonus on the world map - clicking on the spot opens the options to bookmark or colonize the location. Just go on the map and trigger the action on any of the cities you own... You can jump between them by using the cities menu - the shortcut to all cities that you own.